Do good things really come in small (and cheap) packages? The Moto E is just about the cheapest smartphone you can get without wanting to immediately throw it out the window. Spend a little more and you can get a lot more but if your budget won't stretch above £100 then this is a fine choice. 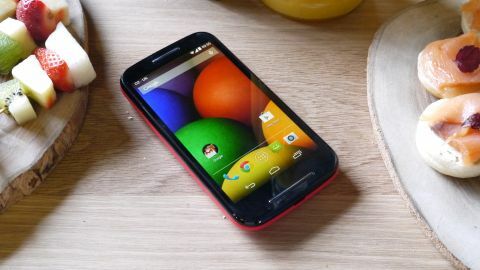 The Motorola Moto E seems aimed at cashing in on the success of the Moto G, a phone which combined mid-range specs with an eye-catchingly low price tag and went on to sell by the truck-load. The approach taken by the Moto E is much the same, except that rather than being mid-range it's an entry level handset with a truly bargain bucket price. So it's not set to replace the Moto G, rather it's intended to bring its cut-price charms to a whole new audience who don't want, or can't afford, to spend upwards of £100 on a phone. And it really is very cheap, coming in at just £89 (around $150, AU$160) SIM free. That's about as affordable as a smartphone gets right now and puts it roughly in line with the Nokia Lumia 520 and the Samsung Galaxy Fame. On paper it stands up well to both those phones, thanks to a 1.2GHz dual-core processor and 1GB of RAM, while the Lumia 520 and Galaxy Fame each only have 512MB of RAM and the latter is even stuck with just a single core processor. The Motorola Moto E also has a 4.3-inch screen, which is a decent size for a bargain handset and with a resolution of 540 x 960 it has a pixel density of 256ppi, making it the sharpest display 'in its category'. So on paper it's arguably stronger than the closest priced competitors in a lot of ways. However it exists in the shadow of the Motorola Moto G, which is only around £30 more expensive and far higher powered. The EE Kestrel isn't much more either and includes 4G connectivity, a feature which the Moto E is very much lacking. While the Moto E isn't likely to win any design awards, it isn't a phone that you're going to be embarrassed about. It feels solidly built and at 142g it's got a pleasing amount of weight to it, maybe even slightly too much weight as it feels heavier than you might expect for a handset of 124.8 x 64.8 x 12.3mm, but I quickly got used to it. That's better than it feeling like a toy and nor is there the sense that it's going to break or scratch at the slightest provocation. It is a little on the chunky side, but its small size and curved back ensure it fits comfortably in the hand. The back is a little slippery, which makes it harder to get a good grip. Speaking of the back, the Moto E is plastic, as you'd expect given the price, and it's also fairly plain and featureless, aside from the 5MP camera lens. My review handset came with a black cover, which gives the phone a smart, classy look. But there are nine different shells available, so if black's not your thing there are other options. As the cover is removable you can also swap it for a new one at a later date if you ever want a change or if yours gets damaged, though as plastic covers go it feels fairly sturdy. I did find it slightly tricky to get off, so it's a good thing that you shouldn't need to do so very often. Under the cover you'll find the micro SIM slot and a microSD card slot with support for cards of up to 32GB. The 1920mAh battery is also visible, but it almost felt like it was taunting me as despite being able to get to it the power pack isn't removable. There isn't much in the way of buttons or sensors to be found on the Moto E. The right edge is home to the power button and volume rocker, which are both easy to hit and have a pleasing metallic look. The top edge has the headphone jack, while the bottom has a micro USB charging port. On the front you'll find a speaker below the 4.3-inch IPS screen, while the earpiece and a notification LED are above it. You might have noticed that I haven't mentioned a front-facing camera and that's because there isn't one. The 5MP snapper on the back is all you get. The screen is reasonably decent considering the Moto E is under £100. It has a resolution of 540 x 960, giving it a pixel density of 256 pixels per inch. That's not super sharp and you will notice pixels if you go looking for them, but it's comfortable to use and actually comes out as the sharpest display in its category. The screen isn't super bright, even when at its maximum setting, and the colours could stand to be more vibrant too. It does feel churlish to level such complaints at a bargain handset however; for the most part it's nice to use and the lack of brightness only really becomes a problem in bright sunlight. Viewing angles could be better. When viewed straight on it's obviously fine, but when sat to the side of me on my desk the screen looked dark and washed out. Again though, this is a £90 phone we're talking about and considering the price tag I was pleasantly surprised. It's also coated in Gorilla Glass 3 to help it resist scratches and it has an anti-smudge coating, though still seemed to pick up a lot of fingerprints, far more so than my (admittedly much more expensive) HTC One. The bezels to the left and right of the screen are nice and small, but the top and especially the bottom bezel are rather larger. Presumably it's space that's being used internally but from the outside it looks wasted and betrays the low cost of the Moto E.
Still, that aside the Moto E is a decent looking device and with its solid build, scratch resistant screen, replaceable covers. It also has the added bonus of being water resistant, so overall it should prove pretty durable. Which combined with its low price makes it a phone that you can safely use in places where you might not want to use a bank-breaking handset. Whether you're camping or clubbing the Moto E is a good choice.